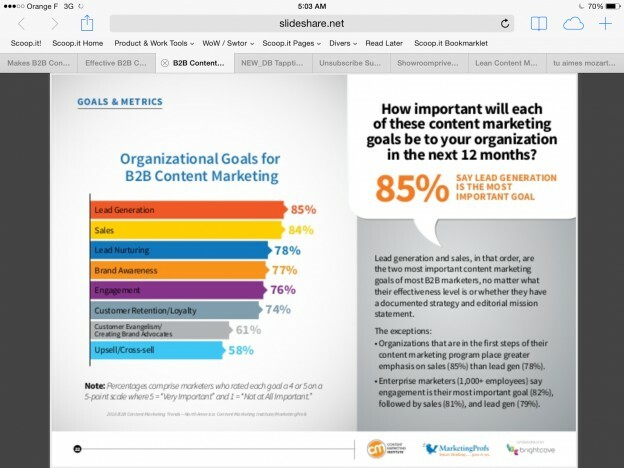 55% of B2B marketers are unsure of the effectiveness of their content marketing. In 2015, in the age of digital and big data, we have a majority of marketers pretty much not knowing what they’re doing – or at least unable to prove it to themselves and their companies. 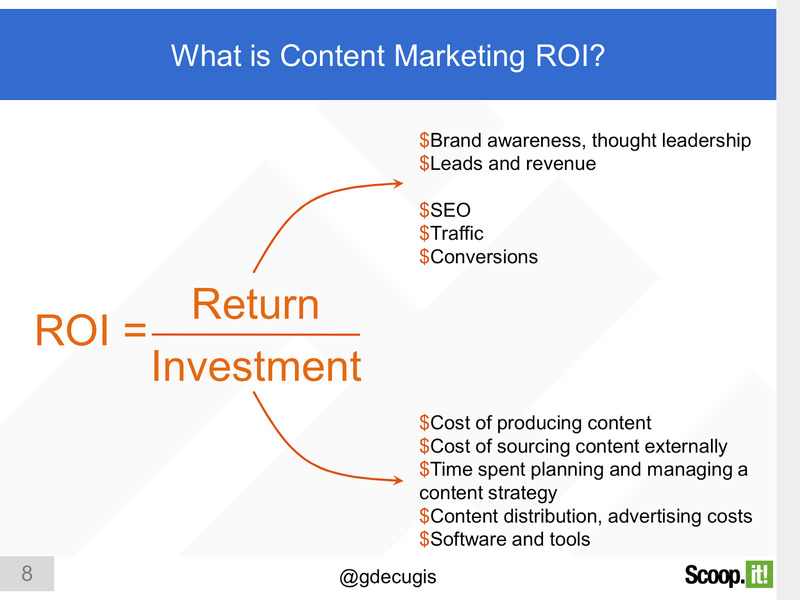 While Content Marketing ROI was hard to define and measure a few years ago, it is no longer true: success has been found by thousands of marketers, the tools exist to measure ROI and the methodology to improve it exists. 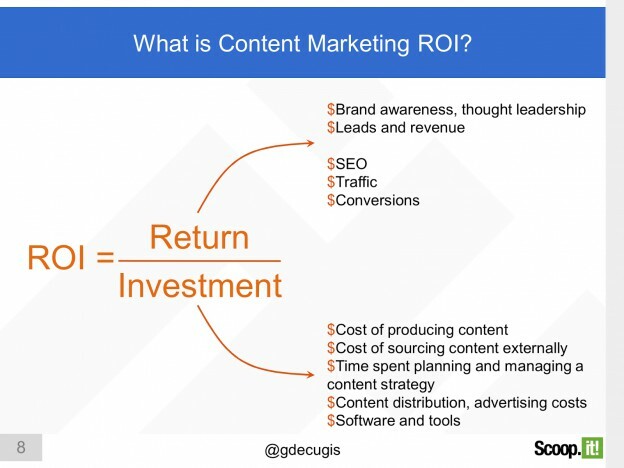 So if you’re one of these B2B marketers unclear about how to define and achieve content marketing ROI, here’s where you should start with. While B2C Content Marketing success might be harder to define, let’s be clear: B2B marketers should focus on lead generation (and therefore revenue). It’s simple and clear. It doesn’t try to hide behind vanity metrics such as social media engagement or traffic that the rest of the organization doesn’t care about (try to convince a VP of sales that you’ve done a good job because leads have gone down but likes have gone up… Good luck!). 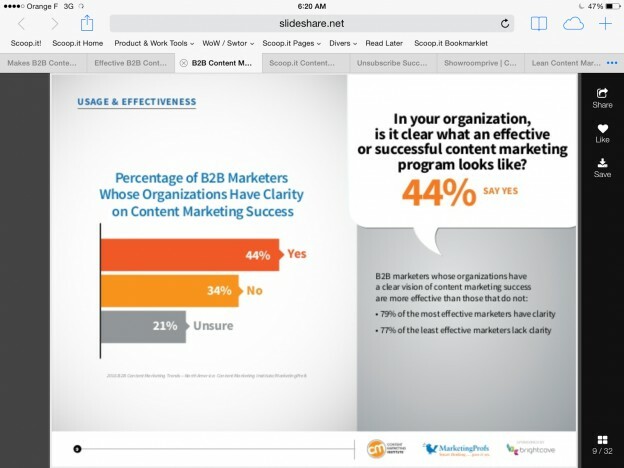 So if it’s so simple, do 55% of B2B marketers don’t know that? – The “first things first” argument: some of them feel they have to walk before they run and that focusing on traffic or social media KPIs is more accessible. – The “not all content can convert” argument: yes, you can maybe convert bottom of the funnel leads with a decisive blog post or white paper but how can you convert a first time visitor to your site who can be months from making a purchase decision? – The “I can get away without showing leads / my boss don’t care” argument: some companies are simply exploring what Content Marketing can bring without asking too much from it yet. None of these arguments stand. 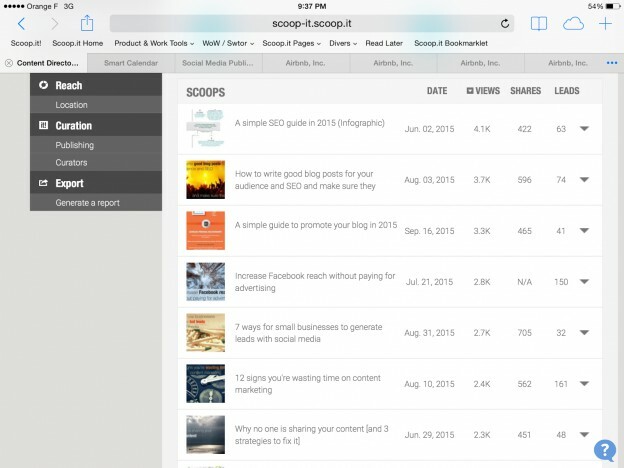 I’ll come back to the ways you can measure content marketing ROI later on but above is our own implementation of it, using the analytics module of Scoop.it Content Director. As you can see, the top traffic posts are not the ones with the highest lead conversions. And this is after months of optimization to focus on conversions: when we started to track lead generation on a post by post basis, we had high traffic blog posts that barely converted at all. Don’t take this the wrong way wrong, traffic and social media metrics can be important and should be measured: but as a means to understand what to improve, not as a final objective. Focusing on traffic and likes is not walking before running: it’s explaining before delivering. Can all content convert? Yes and it should, but not for the same type of conversions. Sure, you won’t magically transform a first-time visitor into a ready to buy prospect desperately asking to talk to sales. But you can get them to sign up for your newsletter, offer them to download a white paper or an ebook or sign up for a webinar. What you need to do is align your content with your funnel, and therefore your calls to action (CTAs): a top of the funnel blog post should have a top of the funnel conversion target (eg “liked this post? Subscribe to our blog”), a middle of the funnel one, a middle of the funnel CTA (eg “to go further on that topic, download our ebook”) and only once you’re at the bottom of the funnel, you’ll present a “talk to sales” type of offer for your readers. Not convinced? Think about this way: if none of your first time blog readers won’t even give you their email address to get more content from you, how can this be success? If your content is good, there has to be a next step you can offer your first-time readers and getting 1% or more of them to take it should be a clear goal. Finally, if your boss or your company lets you get away without having to bring leads, then good for you… while it lasts. It’s ok to be exploring: nothing wrong with that. But this won’t last: a lot of marketers who told me 2 years ago, we just want to get used to content marketing first are now telling me lead generation is the clear target. Simple… to define but now let’s look at how to measure and achieve. A reason marketers are unclear about content marketing effectiveness is also that while they know what they want to focus on (85% place leads at the top and the 3 main goals B2B marketers have are all lead/sales related), they don’t know how to measure it. How can you easily measure the impact of your content on lead generation? What you want to have to measure Content Marketing ROI is a clear attribution of leads to each individual piece of content. Not a correlation – a one-by-one attribution. Because nothing else will let you know how to evolve your content or tell you what worked and what doesn’t. You have to know for each individual post whether it performed better than the previous one. And while here again, there are ways to refine this measure (you can debate about the various attribution models’ benefits in a second phase), the fact is you’ll learn so much from implementing a basic attribution report like this that you’ll want to focus first on improving your content to achieve ROI. And if you’re not sure about how you should look at this data, use our free content marketing analytics framework. So once you know how each piece of content performs on an individual basis, some low hanging fruits will appear: stop doing the nice kitten picture post that got 200 likes but converted no one and do more actionable posts that generated 100 conversions. The next step will be to improve ROI which means either getting more results for the same cost or finding ways to deliver these same results at lower costs. Or even both at the same time. Lean content marketing is inspired by the lean startup methodology and the idea that it doesn’t take being “big” to succeed. Startups are small to begin with and yet they succeed where big companies fail and go on to change the world. A lot of times, that’s because they’re lean. And that applies to marketers too, and to content marketing in particular. – Leverage other people’s content through content curation: for blog ideation, to supplement your own content, to add credibility to your editorial line and build relationship with influencers. Here’s for instance how to cut down the time to write a blog post from 4 hours to 15-30 minutes with content curation while still getting SEO and social media traffic benefits. – Repurpose content to increase the lifetime of your content and reach a larger audience: each piece of content is an investment you make which shouldn’t rot and decay once published. Make your content work double or triple duty by repurposing it under various formats and over time. Here’s for instance how we created eBooks more easily by repurposing blog posts while actually seeing a better download volume. – Amplify your social media channels by sharing your content multiple times: a lot of marketers still hit publish and pray. Don’t be one of them. Content promotion is probably as important as content creation. Think about social media as radio and program your blog posts or eBooks as music hits: multiple times over the weeks after they’re released, on and on over months for evergreen content. – Leverage your team for social media distribution: remember that VP of sales who wanted leads? Make him share your content: as you’re now showing her it will generate leads, she’ll be even more likely to do so and you should even make that process systematic with at least all your front office team members. – Leverage publishing automation and software: content marketing involves a great deal of tasks, a lot of which can be automated so that you can save time. Including some of the best practices above. Stop copying and pasting the same content twenty times to promote it or the same data to build reports. Focus on creativity and strategy and automate the rest through content marketing software such as Scoop.it Content Director. While marketing automation technology helps you work faster and more efficiently throughout the various stages of content marketing, content marketing intelligence helps you improve by finding actionable opportunities for you that you can leverage in just a few clicks, helping you work smarter, not just faster. By leveraging technology and intelligence, you can optimize your efforts in every phase to ensure you reach your goals and deadlines. 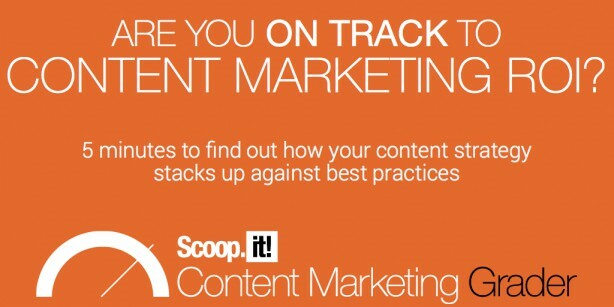 There are many other best practices to make your content marketing lean and achieve / improve Content Marketing ROI. We constantly publish new ones on our blog (or curate / repurpose successful ones: we do what we preach!) and you’ll probably develop your own over time. But if you’re unsure where you are in the process, you can take this test and assess in 5 minutes whether you’re on track and what to focus on to improve. We live at the age of content but also of digital and data. Content Marketing is an old strategy that became a priority because of Web 2.0. But it shouldn’t be mysterious or magic: for most B2B marketers, Content Marketing ROI should be generating leads through content for a given budget, something they can measure and improve through lean content marketing methodology and software. 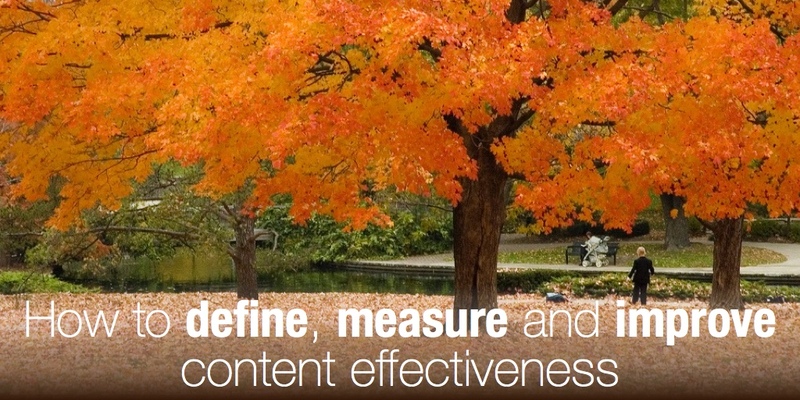 1 Comment on "Content Marketing ROI: how to define, measure and improve content effectiveness"